Customer support can make or break your business. Today’s customers want to get personalized attention from a company, and live chats embedded in your website using Facebook Messenger or Intercom are increasingly popular. But voice message plugins for WordPress exist, too. And giving your customers and users the option to speak to you directly through your website is not a bad idea. You have a few options for voice message plugins. Let’s look at them to see which is the best fit for you and your customers. But Why Use Voice Message Plugins? Generally, it’s better to speak to someone than type. Much nuance is lost in text communication, so letting your visitors and users and customers reach out and actually tell you what’s wrong is a fantastic way to built trust. You can also really build community this way, as you or your brand will appear far more approachable than your competitors. Instead of just being a logo or a color palette that sells alpaca wool blankets, you are now a person somewhere in the world who cares about them, who listens (literally), and make sure that they are heard. Plus, when they have something good to say, you get to actually hear them tell you how great you are instead of trying to do it through clever emoji strings. One of the top voice message services out there is SpeakPipe. While you do need a SpeakPipe account to use the plugin, your users do not. They just have to click a button and record whatever message they need to send you. Most features of SpeakPipe are premium, but there is a free account for you to try out. It is rather limited — 20 messages per month, each with a max duration of 90 seconds. But if you want to see how your users respond to having this option, it’s more than enough. Where Excitel excels is in customization and data. You can set various working hours so that your users can reach you directly instead of just leaving a voicemail. Since you can do live calls, you can also take multiple calls at once. You can forward calls via the plugin to different departments that may be able to handle the situation better than whomever answers, and you get many, many data export options and the ability to record calls for feedback purposes on your operators, policies, or whatever else you need it for. This one’s super neat if you ask me. Instead of sending you a private voice message, your users can leave actual voice messages in the comments section. Sure, that has the potential to be a moderator’s nightmare, it also opens up a lot of possibility for discussion and community building. Made by the same folks who made number 3, Pipe is actually a video recorder for your website. So while it’s not technically a voice message plugin, it works the same way, only it’s a bit improved because it’s video messaging. Your users can send you video snippets that work just like voice messages left as voicemails. They have lots of hosting options, and what is neat to me is that they not only have the WordPress plugin, but also an integration with Gravity Forms, which I am sure a lot of you use. The software isn’t free, but there’s a 2-week trial you can sign up for that will let you try everything out and see how cool this is. Twilio brags about being easy (it’s in the name) and having a 2-step process for your users. Click and put in their phone number, get connected to you. That’s it. Well, it’s a bit more complicated than that since Twilio actually uses their number to call them back on your behalf, but the end result is the same. They came to your website, and they are now speaking with you. The service itself is free, however there is a Pro upgrade that adds many options such as rejecting calls, blacklisting numbers, and limiting the number of calls users can make from your website. Heyoya is a comments plugin that integrates voice and text for your users. Like the Audio Comments plugin above, you get to hear what your users think in their own voices — be that good or bad for your moderation team. The cool thing about Heyoya is how slick the interface is and how easy it is to use. Giant buttons for recording, an integrated text area, and even the ability to upload images and video to the comment itself. It is incredibly powerful. While it’s technically not a plugin, you can include Google Voice or Hangouts on your website to accomplish the same thing and have people leave you voice messages. All you have to do is have a Google account, and you can do it. You’ll just want to use any widget or place on your site that can accept HTML code, then check out the Google documentation to find the embed code that will work best for you. Once you’ve got the code you need set up, just paste it into an HTML widget, and you’ve got a Hangouts button that people can use to call you. If customer support or community building is important to you, it will probably do you very well to look into a voice message plugin. Even if you don’t get many voicemails sent to you, when you make yourself available to your customers or audience, you’re building loyalty and trust. These days, folks spend their money and time on things and people they know and trust. Being able to have a real-time (or even pseudo-real-time) conversation with someone by voice is a much more personal experience that will have a big payoff in the end. What do you think about including voice messages on your website? Have you ever tried it? Let us know your thoughts in the comments! WOW! What will they come up with next? Wouldn’t it be neat to use facebook messenger’s voice note feature? Some very cool option in there. Great post! Thank you for the article. 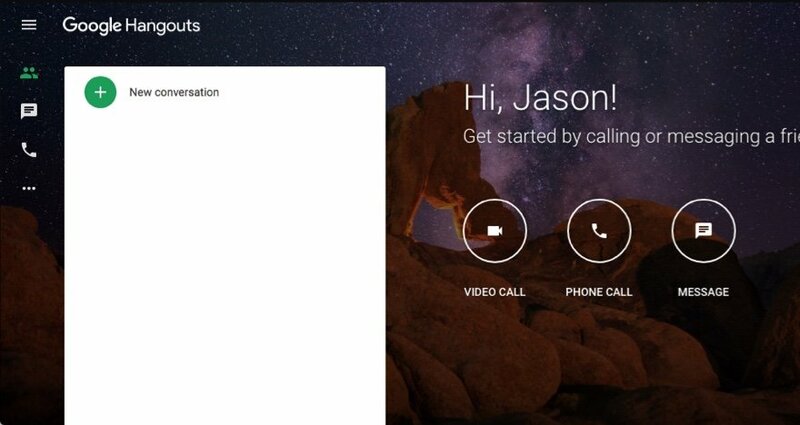 With Google Hangouts, you both have to have a Google account, correct? Do any of them turn the voice message into text and send it as an email? We use a company to take our overflow/out of hours calls and they take a message and email it to us so we can call the customer back. A voice message service that does this would be of great use and open up options for creating support tickets by making a call etc. I would bet that there is a way to achieve this using Zapier if there isn’t a plugin that alreay does what you want. Great idea. I’ll take a look. Thank you. So far I’m learning to use wordpress with Divi. A voice mailer plug-in is something I’m going to need, since my page is about affiliate marketing, and I’m going to need a service like this. The question is, is there any for now free to if it doesn’t have as many features as a paid one in order to be tested? Having Voice on a social site or having video messaging on a site will soon turn out as a nightmare for those running the sites. GDPR hooks in here fully and you would need to check actually every single message send for information which should not belong in those messages. Until now there is no way to even find those parts easily. So I would suggest leaving that part to companies who have the necessary resources. A different thing is when you have a button and then a connection gets placed as a one by one or even one by many known users. Here you can inform all users before and you are actually present and could stop and later delete the audio or video when GDPR relevant information get in there. Indeed having an option to communicate with your customers with voice or video is nice. The best option on the market which is free is unfortunately missing – appear.in – it is a great solution which is, fortunately, running always on the appear.in Server run by a Norwegian EU company and no storage in the US! They comply 100% with GDPR and best of all, it is Free, you can have even your company name account, you can use it with up to 10 users simultaneously – great for teachings or tech support – you can share the screen, you have a chat option beside it which is great to take notes beside chatting. Excellent well-informing article. Thank you! The whole concept sounds like a brilliant idea however I wonder how much extra bandwidth you end up using. I also like the idea put forward by Stuart to have a voice to text conversion. It would be interesting to see an A/B test that compares a text based plugin versus the voice based plugin. The Audio Comments Plugin shows it’s not been updated in over a year. Do you think it’s a good sign if a developer hasn’t found ANYTHING they can do to their product in that space of time to justify an update? With ever-evolving security issues, browser and programming language updates and more, I personally would at least look at doing a bi-yearly or quarterly update to keep user confidence in my software. A lot can change in a year – especially when it’s on Internet time.